Agency Unityworks made a demo ad for Kia. The pre-roll spots can't be skipped. The 30-second TV spot has long been a staple of the car business. But that format doesn’t always cut it in the digital world, where advertisers have only a few seconds to grab the attention of consumers. 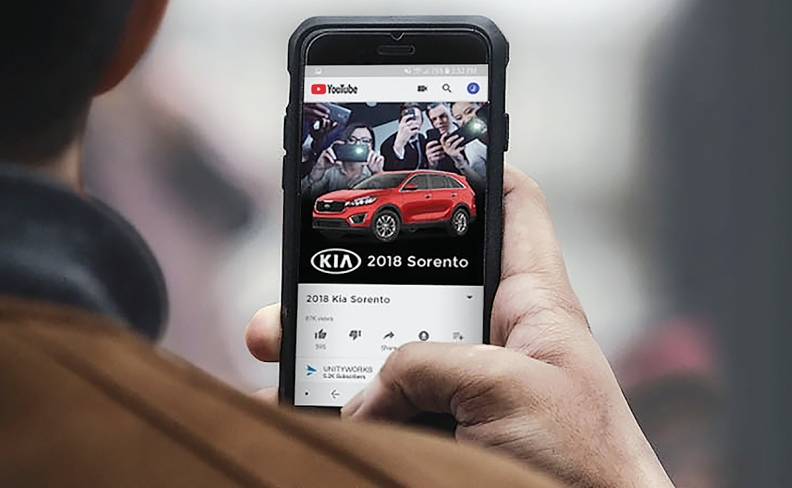 This reality is pushing dealers and automakers to consider YouTube bumper ads, which require advertisers to deliver snappy messages in six seconds or less. The brief pre-roll spots, which rolled out in 2016, cannot be skipped. Ad agency Unityworks says the six-second concept is still fresh, but dealers are beginning to catch on and show more interest in trying it. The agency is developing short ads for Ed Morse Automotive Group in Delray Beach, Fla., says Phil Sura, Unityworks’ vice president of Tier 3 sales. The dealership group will use the mini-spots to inform consumers about a college football ticket giveaway and a campaign around disaster relief for Hurricane Irma. Ed Morse ranks No. 86 on Automotive News’ list of the top 150 dealership groups based in the United States, with retail sales of 11,238 new vehicles in 2016. Sura shared a demo ad for Kia dealers that the agency created to hype the upcoming Stinger sedan. It begins with several people taking photos of an unseen object with the headlines “2017 NAIAS Best In Show” and “Eyes on Design Award” flashing quickly across the top of the ad. In the closing seconds, the Stinger appears as the ad asks viewers if they’re curious — all in six seconds. Sura says many YouTube ads are still 30 seconds, but he expects to see a shift to more abbreviated messaging. Dealers and their agencies may not have to change their thinking too much when creating bumper ads. They can take what they’ve learned from print ads and apply it to the digital space. Leto added that Google didn’t pull the concept of the six-second ad out of thin air.